AHCA/NCAL consultant, Podesta Group, has released a memo outlining its projected impact, the state of contingency plans, potential alternatives and political consequences in the important Affordable Care Act (ACA) litigation, King v Burwell, scheduled to be heard in the US Supreme Court on March 4, 2015. The House Ways and Means Committee announced Tuesday that H.R.876, the NOTICE Act, will be sent to committee for marking up on Thursday, February 26th. The Notice of Observation Treatment and Implication for Care Eligibility (NOTICE) Act, sponsored by Congressmen Lloyd Doggett (D-TX-35) and Todd Young (R-IN-9), requires hospitals to give formal notice to patients within a period of time after classifying them as an inpatient or as an outpatient under observation. The legislation was reintroduced February 11th of this year after gaining support in the House last year. The committee markup stage of legislative drafting will allow the full Ways and Means committee to debate, amend, or rewrite the Act, if desired. Often times, patients have no idea what their status is in a hospital or the importance of it, as hospitals are not currently required by federal law to inform beneficiaries of in- or outpatient status. Outpatient observation stays do not qualify beneficiaries for Medicare coverage of skilled nursing after time in the hospital. Observation status can cause rapid spend-down, accelerating the time frame in which seniors will have to turn to programs such as Medicaid to pay for their care. AHCA/NCAL supports the NOTICE Act as it is an important step in ensuring that beneficiaries understand what is happening to them. The House Energy & Commerce Committee held a hearing on the US Department of Health and Human Services (HHS) role in the approaching deadline for ICD-10. The majority of the Subcommittee members concede that there is no need for any further delays for the code set implementation start date on October 1, 2015. Republicans on the Subcommittee are concerned that the “botched roll out of HealthCare.gov” have forced them to consider whether the Centers for Medicare and Medicaid Services (CMS) can truly be ready by the October deadline to implement the 10th version of the International Classification of Diseases (ICD-10). The Subcommittee has called upon CMS to share a contingency plan in case its systems have trouble implementing the new codes this fall. To obtain background information and a transcript of the hearing go to http://energycommerce.house.gov/hearing/examining-icd-10-implementation. The US Department of Health and Human Services, Office of Inspector General (OIG) has issued an Advisory Opinion (AO) in response to a question from an excluded provider about payments for services performed prior to the effective date of his/her exclusion from the federal health care programs. OIG determined that in this instance, the excluded provider was entitled to receive payment from the buyer of his/her medical practice for services furnished prior to exclusion from the federal health care programs. Pursuant to a criminal plea and a civil False Claims Act (FCA) settlement, an individual provider was excluded from participation in the Federal health care programs for a period of 20 years. The effective date of the exclusion was October 25, 2013. Under the terms of that global settlement, the provider also was required to divest all ownership of his medical practice. The sale of the practice’s assets were finalized in an agreement dated October 31, 2013. Prior to the exclusion date, the individual provider performed services and submitted claims for services but the federal government did not make any payments for these services until after the individual’s exclusion date. In selling his/her medical practice, the excluded individual negotiated with the buyer that it would remit all payments received from the federal government prior to his/her exclusion date for services that the individual provider had furnished. According to the OIG, under the Social Security Act, Section 1128, no payment can be made by any federal health care program for any items or services furnished directly or indirectly to an excluded individual. However, in this specific case, OIG distinguished the individual provider’s situation because the services were furnished before the effective date of the exclusion. Therefore, OIG concluded that in this specific instance, receiving payment from the buyer for services after the exclusion date did not violate the terms of the provider’s exclusion and would not give rise to additional administrative sanctions. To obtain the complete OIG AO go to https://oig.hhs.gov/fraud/docs/advisoryopinions/2015/AdvOpn15-02.pdf. The US Census Bureau is conducting tests in 2015 that they believe could significantly improve the upcoming 2020 Census. Census tests are scheduled for April 1, 2015 in Maricopa County, AZ and Savannah, GA area. 1) Evaluate and compare different census content, including race and Hispanic origin, relationship, and within-household coverage. 2) Test different contact strategies for encouraging households to respond and, specifically, to respond using the less costly and more efficient Internet response option. 3) Test different options for offering non-English materials, to provide language support for respondents with limited English proficiency. As referenced for the above April 1, 2015 tests, the National Content Test may also impact nursing centers, assisted living communities, ICFs/IID, waiver group homes, and ID/DD residential services. Earlier this month, AHCA shared information about Purdue University College of Pharmacy’s Center for Medication Safety Advancement performing a research survey to assess the current insulin pen utilization in the long-term care setting. The goal of the survey is to assess the prevalence of insulin pen utilization in the long-term care setting and identify best practices to mitigate risks associated with pen utilization. The survey can be found here: https://purdue.qualtrics.com/SE/?SID=SV_8iu5o0ADWNvKw1D. Please complete before Friday, February 27th. The Affordable Care Act (ACA) contains a number of provisions affecting taxes, fees, and additional reporting requirements. Most of these provisions apply to all types of entities including long term and post-acute care providers. As an employer, it has been increasingly difficult to monitor and comply with all ACA provisions. Rick Krueger of CliftonLarsonAllen will provide an overview of key provisions affecting employers and explain key action items required to comply with the law during this webinar. · Review and gain an understanding of key changes to tax law affecting employers and employees. · Discuss key changes in arrangements to reimburse employees for health insurance. · Review employer reporting requirements and deadlines. · Discuss other changes affecting fees and premiums under the ACA. AHCA members can now utilize the new Length of Stay (LOS) metric offered in LTC Trend Tracker, an online analytics tool that enables long term and post-acute care providers to access key information that can help their organization succeed. This new feature is part of AHCA’s ongoing efforts to make LTC Trend Tracker a central place to access key data, including all the data CMS collects on skilled nursing centers. In addition, members can find exclusive, in-house measures to help gain insight on hospital readmissions and discharges to the community. They can also upload their RUG data and will soon be able to learn about CMS’s recent changes to the Five Star rating system. Visit www.LTCTrendTracker.com for more information and to learn about the new LOS metric. Please contact the LTC Trend Tracker team with any questions. ENERGY STAR’s 2015 Battle of the Buildings competition is now open for registration. In past years, competitors who reduced their energy consumption saved an average of $25,000 and reduced energy consumption by 8%. This is EPA’s fifth year and in 2014, more than 100 teams threw their hats in the ring. Teams were made up of at least 5 buildings and included different types of buildings. Teams can come from a region, by city, state, or other configuration. EPA will recognize teams and buildings with the biggest reductions, and will once again offer recognition to any competitor reducing energy or water use by 20% or more. ENERGY STAR is making a massive recruitment effort now in the senior care sector and is offering the following items. Check out the sample Web banner, buttons, newsletter articles, tweets, and web text. Would you consider using it? This past fall, ENERGY STAR expanded space types eligible for a score and recognition to include multifamily. This will enable members that have predominantly senior independent living to benchmark, receive a score, and potentially be eligible for recognition. More information can be found at www.energystar.gov/BattleOfTheBuildings. Winners are recognized during NCAL Day held at the 66th AHCA/NCAL’s Annual Convention & Expo in San Antonio, Texas in October. For more information and to submit a nomination, please visit www.ncal.org. Completed nominations must be submitted no later than Friday, May 15, 2015. Senator Blanche Lincoln, who is the Founder and Principal of the Lincoln Policy Group, is confirmed to speak at AHCA’s ID/DD Hill Fly-In event on Tuesday, March 24, 2015. During her 16-year career in the U.S. Congress — first as a two-term member of the House of Representatives and then as a two-term member of the U.S. Senate — Lincoln built a reputation as a results-oriented, bipartisan legislator. She served on several Committees in Congress, including the House Committee on Agriculture, House Energy and Commerce Committee, the Senate Committee on Agriculture, Nutrition, and Forestry, the Senate Committee on Energy and Natural Resources, the Senate Special Committee on Aging, and the Senate Finance Committee. She continues to be recognized as a national leader in the areas of agriculture, anti-hunger, aging, healthcare, international trade, taxes and energy policy. AHCA/NCAL will be participating in a panel discussion this coming Wednesday in Washington, D.C. to address the topic of how health information technology (HIT) will address care delivery in the post-acute setting. The discussion, “Adopting Information Technologies for Post-Acute and Long Term Care: Achieving Care Continuity,” is hosted by The Institute for eHealth Policy and features a collaboration between AHCA/NCAL members and the National Association of Home Care & Hospice (NAHC). The panel will focus on how HIT can be utilized to achieve better continuity of care and communication between long term care providers and other partners in the care continuum such as hospitals, health plans, and accountable care organizations (ACOs). • AHCA/NCAL member, Rusty Williams, VP & CIO, Good Samaritan Health, Sioux Falls, S.D. Invited guests include providers from various settings as well as two employees from the Department of Health and Human Services Office of the National Coordinator for HIT. The panel will be held in SR-385 Russell Senate Office Building on Wednesday, February 25 from 12 Noon-1:45pm. For more information on this panel, please visit www.e-healthpolicy.org or click here to register. If you have any questions on HIT or the panel feel free to contact Dana Halvorson or James Michel. MLN Matters article “Continuation of Systemic Validation of Payment Group Codes for Prospective Payment Systems (PPS) Based on Patient Assessments” was recently released. It applies to Skilled Nursing Facilities submitting claims to Medicare Administrative Contractors (MACs) for services provided to Medicare beneficiaries. It informs MACs about the changes needed to implement the Fiscal Intermediary Standard System (FISS) changes required to refine the interface between FISS and the Quality Improvement and Evaluation Service. These changes include new fields to house an Assessment Identification Number (AIN) for each Health Insurance Prospective Payment System (HIPPS) Revenue Code line on submitted claims. It is important that billing staff are aware of these changes. Click here to access the MLN Matters article which has a July 1, 2015 effective date. With it being tax season, you might find the IRS.gov's website that is focused on the Affordable Care Act's (ACA's) tax provisions for employers to be resourceful. As you are likely aware, the ACA contains benefits and responsibilities for large and small employers, with an employer’s size being determined by the number of its employees. According to the IRS site , employer benefits, opportunities and requirements are dependent upon the employer’s size and the applicable rules. Generally, an employer with 50 or more full-time employees or equivalents will be considered a large employer. · Fewer than 25 full-time equivalent employees may be eligible for a Small Business Health Care Tax Credit to help cover the cost of providing coverage. · Generally 50 or fewer employees may be eligible to buy coverage through the Small Business Health Options Program (SHOP). You can learn more at HealthCare.gov. · 50 or more full-time equivalent employees will need to file an annual information return reporting whether and what health insurance they offered employees. In addition, they are subject to the Employer Shared Responsibility provisions. · Regardless of size, all employers that provide self-insured health coverage to their employees must file an annual return reporting certain information for each employee they cover. Certain affiliated employers with common ownership or part of a controlled group must aggregate their employees to determine their workforce size. Proposed regulations and FAQs provide more information about determining the size of your workforce. The National Center for Health Statistics (NCHS) has released state tables using the 2012 wave of the National Study of Long-Term Care Providers (NSLTCP). Information on residential care communities including: assisted living, skilled nursing centers, hospice, home health agencies, and adult day services are included in the tables. Selected characteristics in the report include: number of providers, number of beds, ownership, number of nursing employees, services provided (such as therapy and hospice), and resident characteristics. The report can be found here. Today, Congressmen Lloyd Doggett (D-TX-35) and Todd Young (R-IN-9) plan to reintroduce the Notice of Observation Treatment and Implication for Care Eligibility (NOTICE) Act HR 876. The NOTICE Act requires hospitals to give formal notice to patients within a period of time after classifying them as an inpatient or as an outpatient under observation. More specifically, the legislation works to ensure that hospitals notify patients entitled to Medicare part A coverage of their outpatient status within 36 hours after the time of their classification or, if sooner, upon discharge. Often times, patients have no idea what their status is in a hospital or the importance of it. This can lead to thousands of dollars in out-of-pocket medical expenses should they need skilled nursing center care following their hospital stay. The observation stays issue is a financial burden on seniors and their families. It can cause unnecessary spend-down, accelerating the time frame in which seniors will have to turn to programs such as Medicaid to pay for their care. AHCA/NCAL supports the NOTICE Act as it is an important step in ensuring that beneficiaries understand what is happening to them. That being said, the association continues to advocate for legislation that would address the observation stays issue once and for all. For more information about observation stays, please visit the AHCA/NCAL website. According to a February 3, 2015, The Hill article by Cristina Marcos and Sarah Ferris, the GOP House voted again yesterday to completely repeal the Affordable Care Act, but this time with instructions for several committees to replace the health care law with new policies. The vote of 239-186 fell largely along party lines, with every Democrat in the chamber opposing the measure. Three Republicans, Representatives Robert Dold (IL), John Katko (NY) and Bruce Poliquin (ME), joined Democrats in voting against repeal. The vote was nearly the 60th in the last four years in the House chamber to undermine or repeal the law. President Obama has made it clear he would veto a full-repeal bill. The National Vaccine Advisory Committee (NVAC) revised the Standards for Adult Immunization Practice in 2013. The Standards call on ALL healthcare professionals – whether they provide vaccinations or not – to take steps to help ensure that their adult patients are fully immunized. ASSESS the immunization status of all your patients at every clinical encounter. ADMINISTER needed vaccines or, if you do not stock the needed vaccine, REFER your patients to a vaccination provider. DOCUMENT vaccines received by your patients in state Immunization Information Systems (vaccine registries). The updated 2015 recommended Advisory Committee on Immunization Practices (ACIP) adult immunization schedule is available online at CDC’s website at www.cdc.gov/vaccines/schedules/hcp/adult.html and was published February 3, 2015 in the Annals of Internal Medicine annals.org/article.aspx?articleid=2107750. The main change in the 2015 adult immunization schedule from the 2014 schedule is the recommendation that adults ages 65 years or older receive pneumococcal conjugate vaccine (PCV13, Prevnar-13®) and pneumococcal polysaccharide vaccine (PPSV23, Pneumovax®23) in series. Both PCV13 and PPSV23 are needed for best protection against pneumococcal disease such as meningitis and bloodstream infections; in addition, PCV13 provides protection against pneumococcal pneumonia. Consult the 2015 adult immunization schedule at www.cdc.gov/vaccines/schedules/hcp/adult.html for pneumococcal vaccination timing and intervals. The advance registration deadline for NCAL’s Spring Conference is this Friday, February 13! Make the commitment to yourself and your company by registering today for this event specifically catered to assisted living providers. Held in beautiful Fort Lauderdale, Florida, March 9-11, NCAL Spring Conference features critical education for assisted living professionals like you. 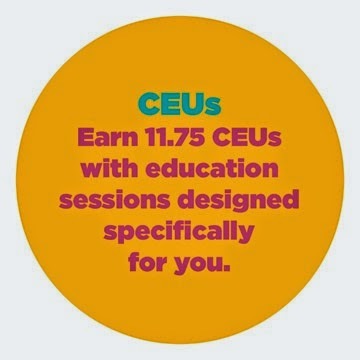 Two distinct tracks give you the opportunity to earn up to 10.5 CEUs while learning about staff stability, INTERACT for Assisted Living, transitioning residents through the continuum of care, and even tips and best practices for opening new communities. What’s more, you will have the chance to network with peers and learn from the best to better your organization – what more could you want? Still can’t make up your mind? See what past attendees found beneficial and exciting about this engaging experience. Share this opportunity with your colleagues. For every individual you bring from your company, they each save $50 off the registration fee! Register by Friday and save $125 off the on-site registration. Affordable Care Act: Clearing up the Confusion for Employers in 2015! Most businesses are still confused about the Affordable Care Act (ACA) employer shared-responsibility provisions that went into effect for many employers on January 1, 2015. This webinar will address your pressing questions relating to the ACA employer requirements. During this presentation, you will hear from a nationally-recognized expert on ACA employer issues, Janemarie Mulvey, PhD. Dr. Mulvey, who recently authored Health Reform: What Small Businesses Need to Know Now! , is the former Chief Economist of the Small Business Administration's Office of Advocacy and worked as senior economist for Congress during the enactment and implementation of the ACA. • Learn the proper methodology to determine provider size (based on FTEs) and full-time status for potential penalty calculations. • Understand how small providers obtain certification to receive temporary relief from potential penalties in 2015. • Review new IRS reporting requirements due in early 2016. • Understand if your employee health plan is affordable and adequate. • Learn how to calculate potential penalties when the provider owns multiple facilities (e.g. controlled groups). • Discuss the implications of the new Republican majority in Congress and upcoming Supreme Court case? This seminar will address these areas and provide easy-to-understand guidance for employers to follow. Janemarie Mulvey, is an economist and award-winning author with over 25 years of experience in the analysis of health and long-term care financing and tax issues. Recently serving as a senior health economist at the Congressional Research Service when the Affordable Care Act was enacted and later implemented, Dr. Mulvey advised Congress on key issues of the law, as well as nuances and complexities relating to implementation. She also served as Chief Economist for the Small Business Administration's Office of Advocacy. 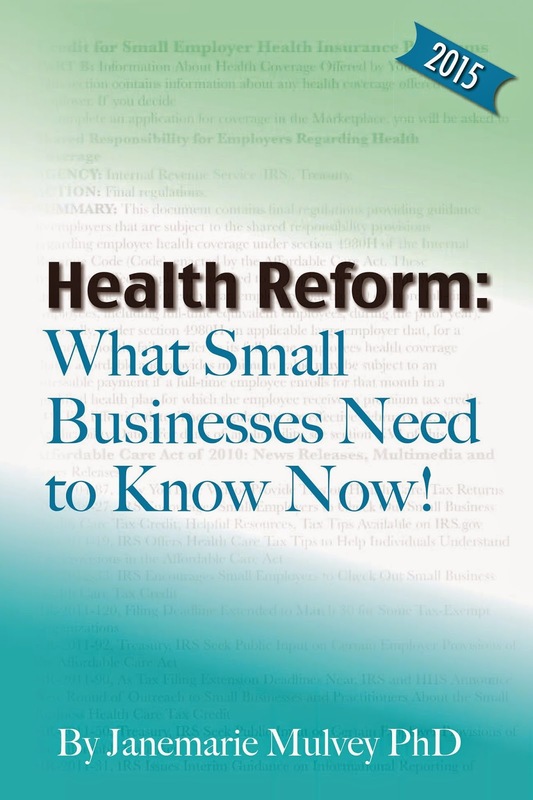 She recently authored a small business guide entitled: Health Reform: What Small Businesses Need to Know Now! Health Reform: What Small Businesses Need to Know Now brings clarity to the often-confusing implications of the Affordable Care Act (ACA). By referencing this guide's up-to-date and easy-to-follow explanations, checklists, worksheets, as well as links to other useful resources, small-business owners can begin to wrap their heads around the complexities of the ACA. Award-winning author Janemarie Mulvey, PhD, is an economist with more than twenty-five years' experience who recently advised Congress on key issues regarding the ACA and served as chief economist for the Small Business Administrations' Office of Advocacy. This call will be Conference Call Only. Please dial-in at least 15 minutes before call start time. Late last week, the Centers for Medicare and Medicare Services (CMS) sent a notice and a FAQ document to organizations representing providers that they were resuming the Medicare Part B therapy manual medical review (MMR) program immediately. As you may recall, the MMR program was implemented by CMS in October 2012 as part of a previous extension of the therapy caps exceptions process. Under MMR, Medicare recovery audit contractors (RACs) are to review Part B therapy claims over a $3700 threshold per beneficiary per year. Due to problems in the MMR process and delays in issuing new RAC contracts, the therapy MMR program was put on a ‘pause’ at the end of February 2014. 1. Starting immediately, RACs may resume part B therapy MMR for all MMR eligible claims over the $3700 threshold for claims paid between March 1, 2014 and December 31, 2014. 2. The reviews will be post-pay review only in all states for the 2014 claim reviews. 3. Claims will be reviewed in chronological order so that, for example, claims paid in March 2014 will be reviewed before claims paid in April 2014.
a. Phase 1 – One claim review request will be issued in the ADR. b. Phase 2 – Up to 10 percent of the total MMR eligible claims for 3/14-12/14 will be included in the ADR. c. Phase 3 – Up to 25 percent of the remaining MMR eligible claims for 3/14-12/14. d. Phase 4 – Up to 50 percent of the remaining MMR eligible claims for 3/14-12/14. CMS notes that this current resumption only applies to facility-based providers, including skilled nursing facilities. In addition, CMS has not identified a process yet for how they intend to conduct reviews for 2015 MMR eligible claims. While CMS state they do not plan to post additional information regarding these reviews, AHCA will continue to seek further clarification. AHCA has been, and continues to be very concerned with the serious flaws in the arbitrary $3700 therapy MMR threshold that Congress established, and how CMS has interpreted to mean that 100 percent of claims above this threshold must receive burdensome complex review, regardless of beneficiary condition, or provider history of compliance with Medicare policy. AHCA is actively engaged with Congress in advocating for therapy reforms like the therapy cap repeal provisions reported out by the Senate Finance Committee in the 113th Congress. However, since that may take some time, we are also seeking immediate reforms to the therapy MMR program as a bridge to the larger reforms, and are asking Congress to require CMS to target MMR reviews and education efforts to providers with a history of improper payments rather than the cumbersome 100 percent review process described above. If you have any questions please feel free to contact Dan Ciolek at dciolek@ahca.org. 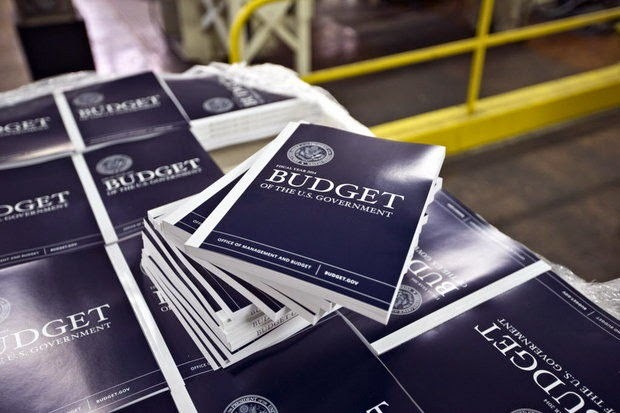 President Obama released his FY2016 proposed budget Monday. Suggested changes to post-acute care remain relatively unchanged from previous years. The Administration did not include a suggestion to cut provider taxes, but renewed its call to reduce market basket payments across the post-acute care sector and lower bad debt payments. Any changes suggested in the budget will have to be approved by the newly Republican-controlled Senate and House. Hearings are expected to be held in the coming weeks. Below is a brief summary of the budget provisions which would affect skilled nursing. The budget reduces the home health, IRF and LTCH market basket update by 1.1% each year 2016 through 2025, with the floor set at a rate freeze. The budget reduces market basket updates for all PAC providers, but accelerates SNF cuts beginning with a -2.5% update in FY2016 and a reduction to -0.97% in FY2023. This is projected to save $102.1 billion from 2016-2025. The President proposes reducing bad debt payments from 65% to 25% for all eligible providers over three years beginning in 2016. This proposal will save approximately $31.1 billion from 2016-2025. This proposal was included in the President’s FY2015 budget. Beginning in 2020, at least half of the payments for LTCHs, IRFs, SNFs and home health services would be bundled. Payments would be bundled for at least half of the total payments for post-acute care providers. A permanent and total cumulative 2.85% cut would be applied by 2022. This proposal is projected to save $9.3 billion from 2016-2025. While it is budget neutral, it is important to note that the President’s Budget implements a value-based purchasing program for several additional provider types, including home health, SNFs, ambulatory surgical centers and hospital outpatient departments beginning in 2017. At least 2% of payments must be tied to the quality and efficiency of care in the first two years of implementation, and at least 5% beginning in 2019. This proposal has no budget impact. The budget requires IPAB cuts to take effect when Medicare spending growth exceeds Gross Domestic Product (GDP) +.5%. Current law is GDP +1%. This is estimated to save $20.9 billion from 2016-2025. The President proposes adjusting the standard for classifying a facility as an inpatient rehabilitation facility (IRF) by requiring that at least 75% of patient cases admitted to an IRF meet one or more of 13 designated severity conditions beginning in 2016. The current standard is set at 60%. This proposal is projected to save $2.2 billion from 2016-2025. As was the case last year, the President’s budget does not propose reducing or eliminating the provider assessments. Since Congress is likely to consider such cuts as an area to save money, it is a positive that the President did not include it in his recent budget. The budget includes a number of proposed changes that would promote the use of home and community based services. These proposals were not included in last year’s budget. It is important to note that even if these options were to be passed into law, states would have to choose to include them in their Medicaid program. The budget includes new investments in program integrity totaling $201 million in FY2016 and $4.6 billion over ten years. These investments include continuing to fund the full Health Care Fraud and Abuse Control discretionary cap adjustment, increasing mandatory Medicaid Integrity Program funding, and providing more funding to recovery auditors to undertake more corrective actions that will help reduce improper payments. In total program integrity investments would yield an estimated $21.7 billion in savings to Medicare and Medicaid over ten years. The deadline to register for the 2015 Independent Owner (IO) Leadership Conference and save is next week. Register by February 13 to take advantage of the early bird savings. Don't miss this opportunity! This year's IO Leadership Conference focuses on How To Survive Medicaid Managed Care as an Independent Owner. Numerous education sessions will inspire you and give you new strategies for success. Additional networking and social opportunities include a reception on Wednesday evening, and a networking lunch and spectacular dinner on Thursday, all in the relaxing atmosphere of the Westin Beach Resort & Spa. Hotel rooms are going fast so reserve yours today! The special AHCA/NCAL group rate is $209 per night single or double occupancy plus 11% occupancy tax. This rate will be extended for three days before the conference based on hotel availability. Hotel reservations must be made by February 9, 2015. Silver and Gold Award Deadline Next Thursday! 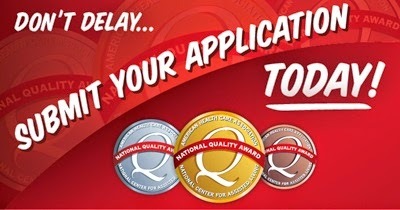 Next Thursday, February 12, is the final deadline for all Silver and Gold National Quality Award applications. All submissions must be entered using the online application by 8:00 pm EST. For some inspiration, watch Executive Director of Golden LivingCenter-St. James, Renee Ridling, a 2014 Gold Award recipient, talk about their quality award journey. Visit qa.ahcancal.org for more information and resources for Silver and Gold applicants. 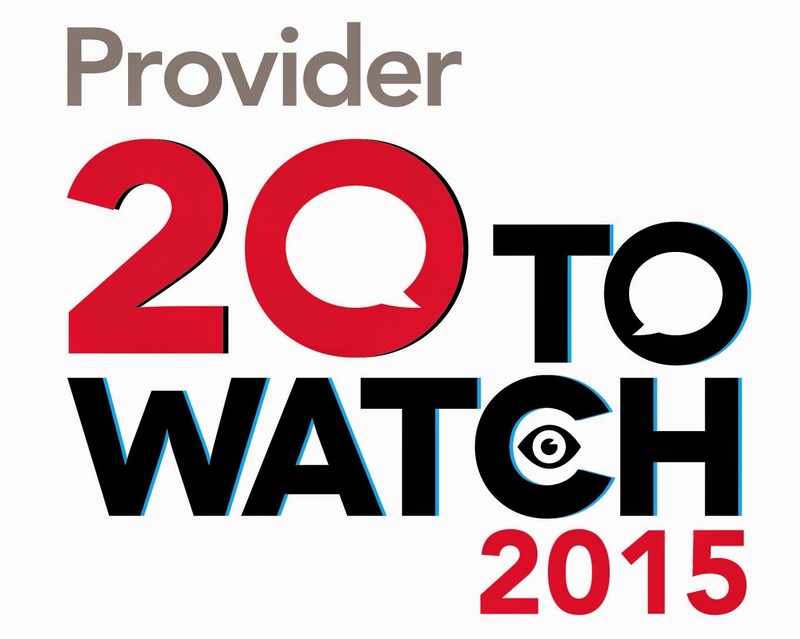 Provider is thrilled to announce that nominations for its third annual 20 To Watch list are now being accepted. We’re looking for the rising stars of AHCA/NCAL-member buildings—from janitor to CEO—who personify the dedication, hard work, and tender care required for a commitment to improving the quality of life for all residents. Nominations are due April 17. Finalists will be featured in a summer issue of Provider and commemorated on our special “20 To Watch” website. 4.) A list of your nominee’s innovative approaches/ideas/programs and how it (they) improved the quality of life for residents and/or staff. CMS updated the Medicare coverage requirements to more closely align with the updated ACIP recommendations. An initial pneumococcal vaccine may be administered to all Medicare beneficiaries who have never received a pneumococcal vaccine under Medicare Part B. A different, second pneumococcal vaccine may be administered 1 year after the first vaccine was administered (i.e., 11 full months have passed following the month in which the last pneumococcal vaccine was administered). Refer to MLN Matters® Article #MM9051 for more information on this coverage change. Purdue University College of Pharmacy’s Center for Medication Safety Advancement is performing a research survey to assess the current insulin pen utilization in the long-term care setting. The usage of insulin pens versus insulin vials in the long-term care setting has been a topic of interest. Insulin pens provide perceived advantages over vials, such as decreased time to prepare the dose for administration and increased patient satisfaction. However, due to reports of insulin pens being used on more than one patient and other errors, such as needle sticks, the benefits and risks of using insulin pens in this setting need to be evaluated. The goal of the survey is to assess the prevalence of insulin pen utilization in the long-term care setting and identify best practices to mitigate risks associated with pen utilization.